For the 24 hours to 23:00 GMT, the AUD declined 0.14% against the USD and closed at 0.7098. LME Copper prices rose 1.3% or $82.0/MT to $6492.0/MT. Aluminium prices rose 0.6% or $11.0/MT to $1879.0/MT. In the Asian session, at GMT0400, the pair is trading at 0.7105, with the AUD trading 0.10% higher against the USD from yesterday’s close. Overnight data showed that Australia’s house price index slid 2.4% on a quarterly basis in 4Q 2018, surpassing market expectations for a fall of 2.0%. In the prior quarter, the index had registered a drop of 1.5%. The minutes of the Reserve Bank of Australia’s (RBA) March monetary policy meeting showed that policymakers are in no rush for a near-term move in monetary policy, as the central bank notified potential risks to the country’s economic outlook. Further, the minutes of monetary policy indicated that labour market remained strong and unemployment continued to decline. 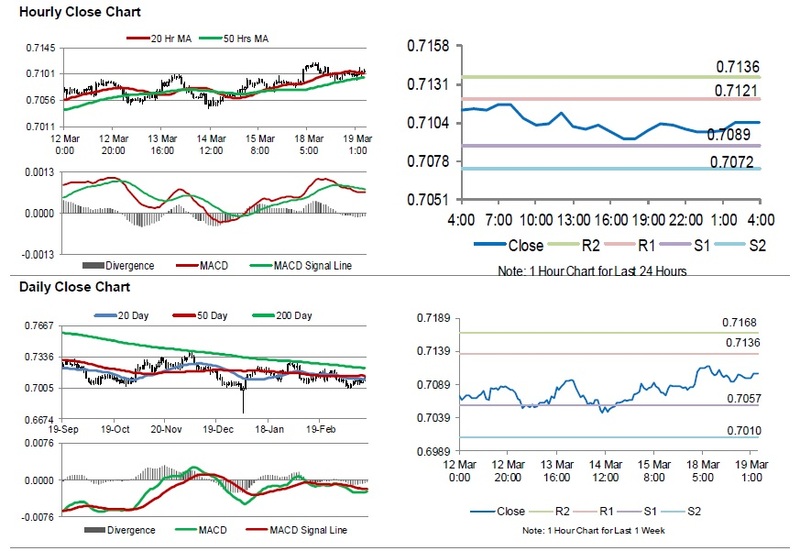 The pair is expected to find support at 0.7089, and a fall through could take it to the next support level of 0.7072. The pair is expected to find its first resistance at 0.7121, and a rise through could take it to the next resistance level of 0.7136. Moving ahead, investors would await Australia’s Westpac leading index for February, set to release overnight.